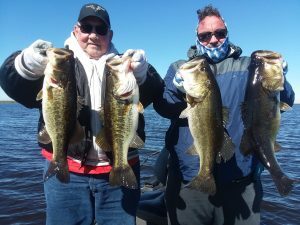 Mike and son Mark Hammus came to enjoy some time together and some Okeechobee Bass catching. The temp. this morning was only 43 deg. but the fish still bit for us! These guys sure can fish making the bites count today and landing several nice fish! 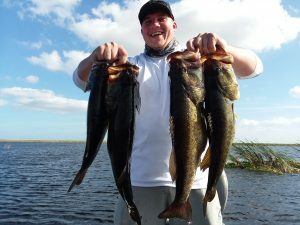 Although the cold weather makes the bite a little slower some days the fish still eat and the fishing will continue to get better and better throughout the beginning of the year into Spring. 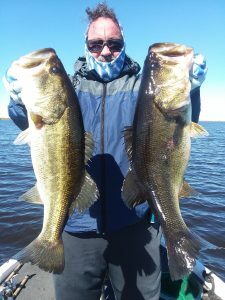 These fish were caught on the South/West side of the lake but fish are being caught all over the lake on senko, worm, top water frogs, etc. The artificial bite is much much slower and can be extremely tough for anyone even the seasoned angler this time of year, but I was always told it a lot easier to feed them (ie.shiners) than fool them (ie.artificial)! 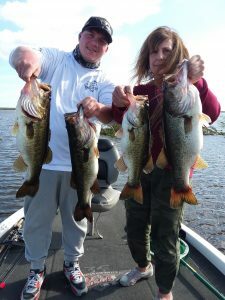 Lonzo Arrowwood and his girlfriend came down from Ohio to fish on Lake O and to enjoy some sun this week. We caught a total of 27 Bass with several fish in the 3-5lb range. The lake was completely glass this morning which has been a rarity this Fall/Winter. Lonzo is Cherokee Indian an has been coming down to Okeechobee since he was a little boy and reminisced about coming down so he had several stories to tell about the lake and fishing here with his dad. 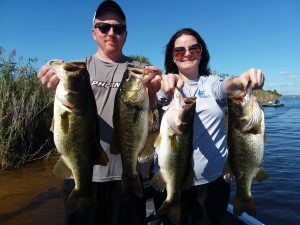 Look forward to seeing this couple again in the future and hearing more old Okeechobee stories as well. 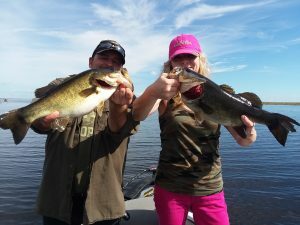 Rick Goette and his daughter Morgan came to enjoy some time together and a great day on the water with OkeechobeeBassFishing.com. They caught several nice bass with a total of 28 bass today. Morgan is one of the top women shooters in the U.S. and is here training with her coach at Quail Creek in Okeechobee. It was a pleasure taking them out and watching Morgan woop her dad in the numbers at the end of the day. 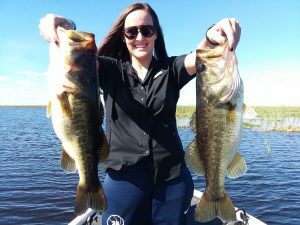 LeAnn Goldstock and her son Dave came down all the way from NY to enjoy some time together and to catch some GIANT Okeechobee Large Mouth Bass and Okeechobee Bass Fishing Guides didn’t disappoint! 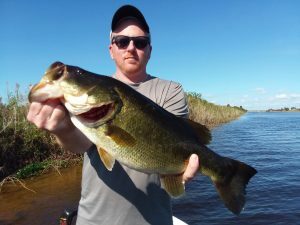 We fished full days on Friday and Sat catching a total of nearly 80 bass with several fish in the 3-5 lb range and a few fish weighing between 5-7lbs. These two real troopers fishing through the high winds and sun burns and still managed to fish NON-STOP! Each and every day has been an adventure and I look forward to each and every day with each and every client! If you haven’t booked your trip yet we still have days left in both this month and next so BOOK your trip NOW HERE! 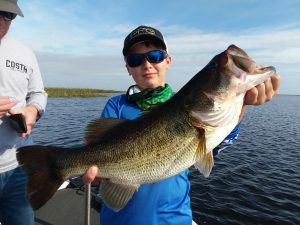 Brent Shaffner and his son Mason had an absolutely amazingly awesome day fishing with Okeechobee Bass Fishing and Okeechobee Fishing Guides today, catching this 10lb. 1oz. swamp donkey. Mason his son caught this Giant as well! 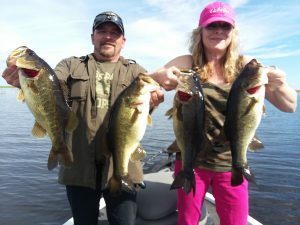 Jason Metcalf and Cat Mitchell had an amazing day on Big Lake O catching nearly 40 bass with several nice fish to go with them. They came all the way from Kentucky to enjoy some fun, sun. 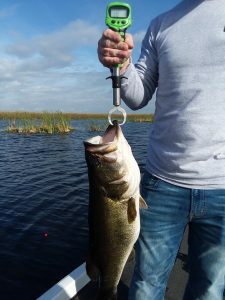 and Big Okeechobee Bass! The fish are eating like crazy, chasing and crushing these shiners one after another this morning. I love my job and I love my clients! 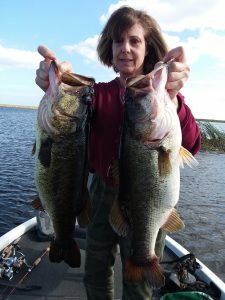 Thanks for coming and thanks for another phenomenal day on Lake Okeechobee. 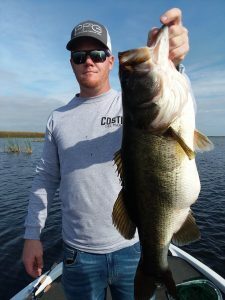 Jason caught this 6lb 2oz Okeehcobee Bass fishing with Okeechobee Fishing Guides!